The client is a law firm and they specialise in family law. This is a new business and they started their business only few months back. The site is almost 3-4 months old. 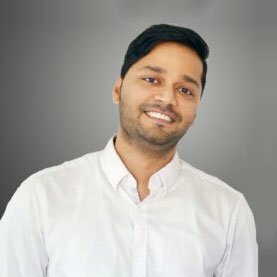 I started SEO less than 4 weeks back. I completed full site audit, market research, competitor analysis and full keyword research within first 2 week. It takes around a day or two to optimise the site once the research part is done. And then moved on to the off-page SEO basically building strong backlinks for the site from quality and high authority sources. 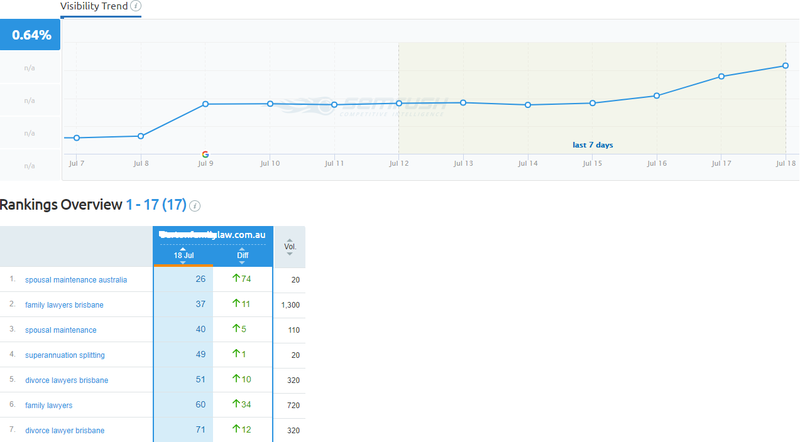 As you can see in the report below, within 2 week of OFF-page SEO, the improvement in the rankings has been excellent. Graph is the search engine visibility of the site. What you see in first column below the graph is the rank of the keyword in Google Australia, second column is the difference in rankings (see the positive movements- this is keywords moving up in Google rankings) and vol is the search volume of keywords means this many users are using this search term every month. I’m confident within next few months, I will help this client reach first page of Google. It is always a great pleasure to see small businesseses grow. This is my passion and it gives me a great satisfaction that I’m able to help so many small business achieve their business goals. 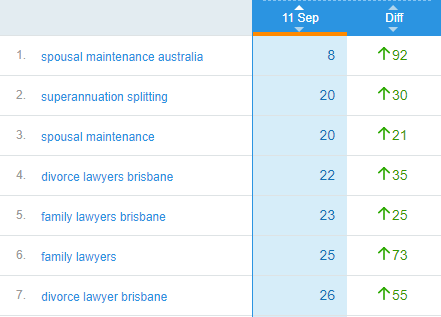 In just few more weeks of writing this case study, the site has further jumped up and one of the top keywords has scored first page ranking in Google Australia.